Upcycling is the new upcoming trend. No need to buy new thing, no shopping required, look at your discards, save your money is the whole story of upcycling. Upcycling means reusing any rejected object in a way to look its best. Another one liner is best out of the waste. Plants are one of the best way to come close to nature. 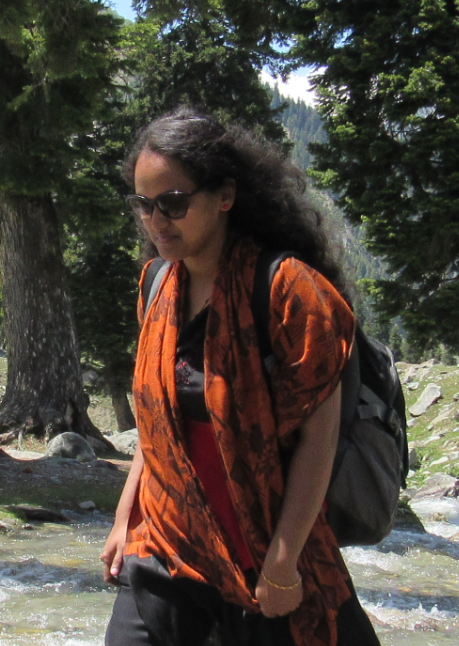 And the best way of connecting to nature is to bring them home in our small gardens or at home. Usually, planter comes in all shapes, designs, sizes and terracotta one. These are commons ones and easily available but nothing uniqueness to it. Now a day, uniqueness is one thing that most of us aspire for. For that, you don’t need to buy a new one, just look around your discarded trash and take a little inspiration. To get started with, we will help you out with some. Old discarded rainy boots come in handy here. Just remove the sole and prick few holes underneath, and add soil, manure, seeds and you are ready to grow some beautiful flowers. You can spray paint the boots or paint it or glue some colorful buttons, sequins or decorate with creative ideas and make a stunning statement in your garden. 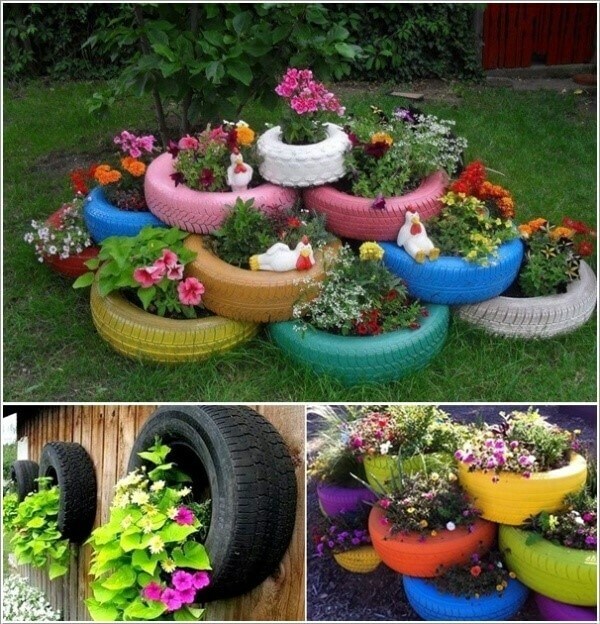 Tire planters are fun and interesting way to spice up your garden. Don’t be shy in going bold by planting these. You can either display as it is or you can give a basic primer spray, let it dry and spray paint it according to your designs, color or choices. Bright colors will lift up your garden up to another level. Go bold with your ideas. We use a lot of bottles on our day to day lives. When our use with those are done, we trash it out, right? Well then recycling it would do more good than ever. 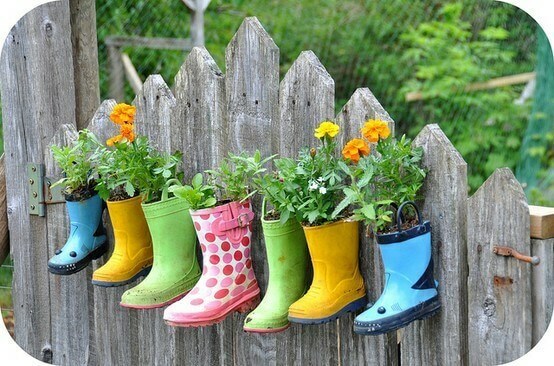 Let’s make some brilliant use of it by reusing in a creative way as planters. You can cut in half, fill it up with soil and plant some herbs for your kitchen. Hang it up or drill it and use them in your garden or home. Decorate it to give a unique touch to it. Give these tin cans a second life by decorating it or spray painting it with bright colors and designs and placing them as planters in your home. You can also make a small herb garden with these in your kitchen and label each as shown in one of the above picture. Make sure to punch holes in the bottom to drain the excess water out. You can paint it or glue some vibrant colored fabric or gift wrap them and varnish it to give a more polished or decoupage look. Aaha!! Now here is something to give your home décor more of a sporty look. 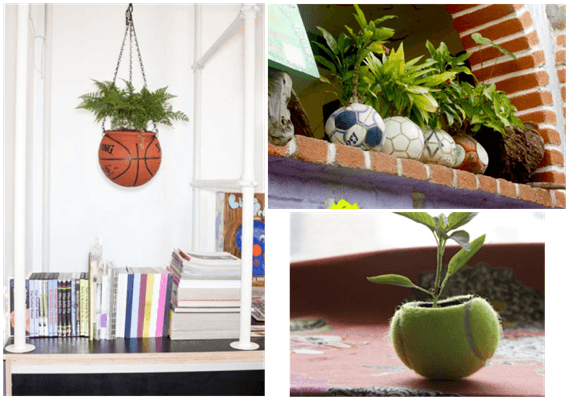 Instead of throwing away worn out or discarded footballs, soccer ball or basketball, reuse them as planters. No need to decorate, just clean it up and place or hang them as it is and show off your creative side with such a simple idea. This idea will surely make you stand out in particular. Any household would have a lot of old unused utensil lying out in trash. Why not use them as planters? This is such a low-cost idea. Old cookers, stock pots, saucepans or colanders are quite handy. They add a rustic charm when placed. Colanders make for an unpredictably effective planter. They already have draining holes in them so you don’t have to do anything besides planting them. Some fresh vibrant bright paint will really make them pop out. Aren’t these cute? Tea cups makes a great planter. Many of them have fanciful designs that would really stand out in your home. They can be placed anywhere and would make a great statement on your table as centerpiece or on your windowsill. Flaunt these teacup planters and add an elegant charm to your home décor. 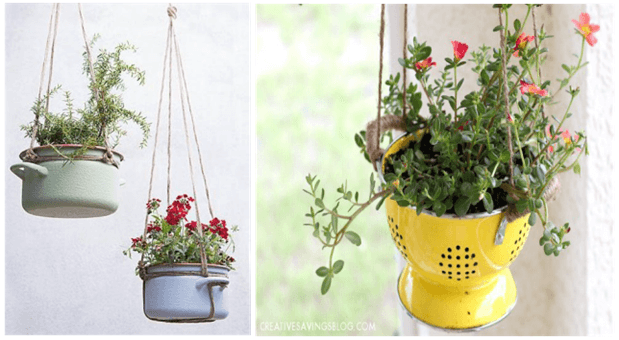 This is a creative and unique idea to reuse an out of style purses or bags into a hanging planter. These can be used both for indoors as well as outdoors. Can be simply hanged on to a wall or fence. This is a sure bet to compliment your garden or home. Punch few holes beneath and Voila! you have a new funky planter ready in no time. These are sure to bring a rustic addition to your garden. These are not something that you would see around mostly, but why not bring these to use and have a little fun with. 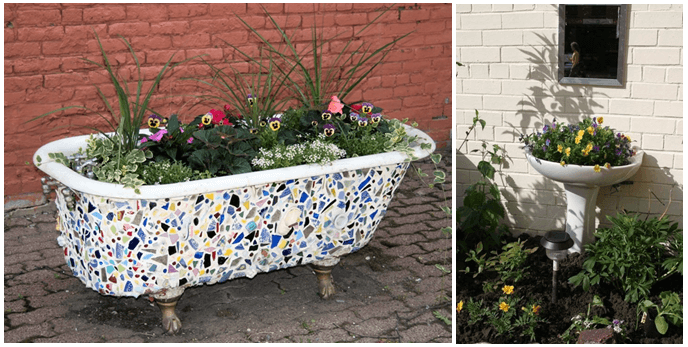 You can always paint or decorate these to give it more interesting look to compliment your garden and space. Who would have thought to use these discarded stuffs as planters, right? 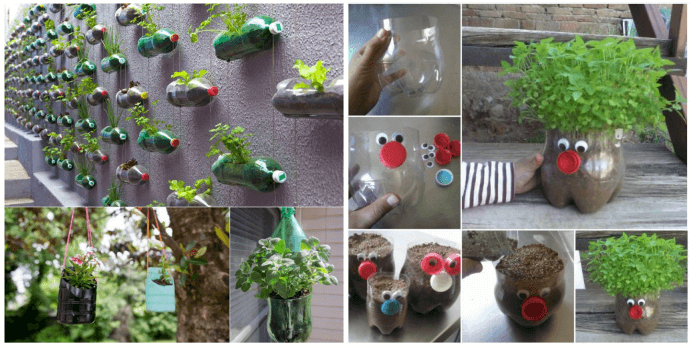 There are many more creative ideas that can crop up by just recycling the trashed items. So, let’s take a look around your surroundings for a little inspiration for your garden and what once seen as useless can ornament with the life of new plants! RE USE & GO GREEN!!! 3D Upcycling: The Answer to All Your Home Junk? Previous story Trendy Splash Of Colors To Fall In Love….